Serving Up Hot Dogs This Fourth of July? What is IN Your Hot Dog Anyway? For my American readers, the Fourth of July holiday is coming up this weekend. This means a lot of us will be heading to the backyard BBQ to fire up the grill and throw on some chicken breasts, veggies, steaks, burgers and hot dogs. Yesterday on my way home from work I stopped by the store to pick up steaks, ground beef and yes, even hot dogs for our holiday grill out as well. Not a fan of hot dogs in general, I usually forgo them but I know they are a favorite of many people and since we'll be grilling for extra teenagers and another couple, I bought them as well. This gave way to todays post. Just what is IN hot dogs anyway? This led me on a little quest this morning and I am posting my findings here so you know as well! 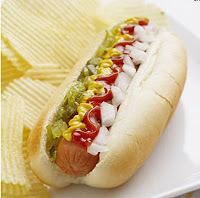 Hot dogs may contain “variety meats” and meat byproducts including the heart, liver and kidneys of various animals along with regular meat cut from the bone, according to the U.S. Department of Agriculture. Every species of meat must be named individually in a hot dog package’s list of ingredients, the USDA says. 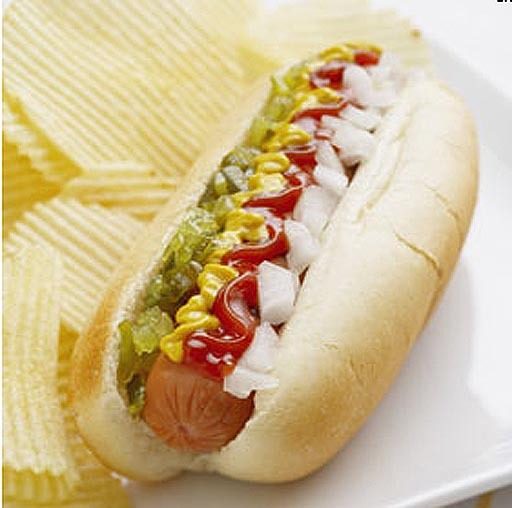 Hot dog producers often make their products from mechanically separated meat, “a paste-like and batter-like meat product,” the USDA explains. Mechanically separated beef, which is a paste-like substance made in a process that separates meat from bone by machine, isn’t allowed in hot dogs or any other food for humans because it could contain Mad Cow Disease, also known as Bovine Spongiform Encephalopathy. Additionally, hot dogs can’t contain more than 20% mechanically separated pork. When we moved to the Midwest we found a regional favorite was 'brats' even more than hot dogs! Beer brats, jalapeno brats, cheese brats... the list goes on. So I looked into bratwurst as well. Bratwurst can definitely be a more meaty and flavorful experience than your average hot dog, and its ingredients might be more easily identified by taste. Typically a brat is nearly twice the size of a regular hot dog, and given its size and weight, contains much less sodium for its weight than a regular dog with 650 mg, or 27% of your daily max. Besides being bigger than hot dogs, bratwursts originally hail from Germany and consist of finely chopped pork, beef or veal. You might think from the lack of new recipes that I haven't been cooking lately... you would be wrong! However, it has been difficult to find the time to upload photos and post. Time. Never enough of it!! 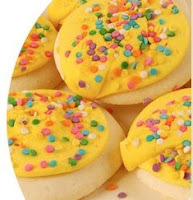 What is amazing about these cookies is that on their own, without frosting... they really aren't that great. They are a thick, soft, fluffy cookie that is NOT very sweet. However, these cookies must be frosted! And once you add a sweet creamy frosting and sprinkles, magic happens. They become addictive! However, on Sunday I decided to make this style cookie and because I didn't feel like digging through my recipe books, I searched the internet for various recipes to see what I could find. In the end I printed out three (3) different recipes for sugar cookies and then used that as my basis to 'meld' them together and see what I get. I topped them not with homemade frosting this time (sorry - but no time!) I simply used the pink vanilla frosting with pastel sprinkles you find in the store. Cream shortening, butter and sugar together until light and fluffy. Add egg, sour cream, vanilla and almond extract. Add dry ingredients together in separate bowl. Slowly blend dry ingredients into the creamed mixture. Don't overmix. Scoop walnut sized rounds and drop onto cookie sheet lined with parchment paper. Press down on them just a bit to flatten the top. Bake 9 minutes at 425 degrees. Don't over bake or let them get brown. Let cool completely and then top with a sweet frosting. Store bought vanilla or pink vanilla works great - not exactly like Lofthouse, but similar and very quick and easy if you are in a hurry. Kellogg said Friday that it is voluntarily recalling some of its cereals in the U.S. due to an unusual flavor and a smell coming from package liners that the company said could cause nausea and diarrhea. 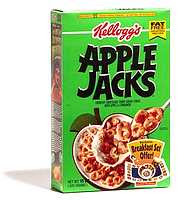 The company said Friday that it is recalling select packages of Corn Pops, Honey Smacks, Froot Loops and Apple Jacks. Kellogg did not say what caused the smell but said the potential for serious health problems is low. The company said some consumers are sensitive to the smell and should not eat the recalled products. Only products with the letters "KN" following the Better If Used Before Date are included in the recall. Products with a "KM" designation are NOT included in the recall. In addition, no products in Canada are affected. If you have questions you can contact the Kellogg Consumer Response Center at 888-801-4163 from 8 a.m. to 8 p.m. Eastern time. Happy Father's Day! Earlier this week I found 2 pound cake recipes that sounded so good at the time I have been craving them ever since. Today I'm in the mood to bake so using both recipes I 'mixed' them and this is what I get. I'm currently baking this with my laptop on the counter next to me. I'll let you know what I think! Cream the butter. Add sugar and mix. On medium speed beat in the eggs one by one. Combine the flour and baking powder as well as combine the lemon juice, lemon zest, and vanilla. On medium speed alternate dry and wet until all ingredients are incorporated. Do not over mix. Be sure to scrape down the sides a couple of times during the process. Coat a loaf pan with butter and dust with flour. Place the batter in the loaf pan and bake at 350ºF for about an hour until done. Insert a wire, skewer or knife in center to test. While the pound cake is cooking, combine the strawberries, lemon juice, and sugar. Allow to marinate and create syrup. Once the pound cake is finished allow to cool until warm. Remove from the loaf pan and slice about 3/4 of an inch thick. Serve with berries and whipped cream or vanilla ice cream. My regular readers know me too well to think I would follow this recipe - even if it's already two recipes blended. My first change was to use 3/4 sugar and 1/4 Splenda. Not much of a reduction in sugar but every little bit is good. When it came time to add the lemon juice and lemon zest I couldn't do it. I really wanted almond instead. So in went a mixture of vanilla and almond extract with a bit of milk instead of lemon juice. I used a triple berry mixture of marion berries, blackberries and blueberries as well as two leftover strawberries I sliced up as well. Instead of ice cream I used Rich's RichWhip sweetened with about 2 T instant vanilla pudding instead of sugar or vanilla. Scrumptious! However next time I will feel perfectly comfortable using just 3 1/2 sticks of butter instead of 4. Even though it calls for a full pound, I think the edges of the cake are too greasy and crisp from the amount of butter and I know it won't suffer by cutting down a tad. My husband loves hot sauce. When we were first married two decades ago he could barely tolerate a dash of Tabasco sauce in a soup or sauce for flavor. Today he's such a fan of really 'hot' sauces that our oldest daughter bought him a 'hot sauce of the month' club gift for his birthday in February. The hotter the better and he loves to buy and try new hot sauces from around the world. In each delivery of hot sauce one or two recipes are included. This recipe is short, quick and easy with only 4 ingredients total; but it's also perfect for this summer's backyard adult grills. Whisk ingredients together. Place meat in a resealable bag and pour marinade over meat. Seal and refrigerate 30 minutes - turning bag at least once for even flavor. Remove bag, discard marinade and grill or broil your steaks to desired doneness. Two popular grocery items are being pulled off the shelves — SpaghettiOs that weren't adequately heated during processing, and Marie Callender frozen dinners that pose a salmonella risk. The Department of Agriculture announced both recalls late Thursday. ConAgra Foods is recalling all Marie Callender's brand cheesy chicken and rice frozen meals after they were possibly linked to a salmonella outbreak in 14 states. And Campbell Soup Co. is recalling 15 million pounds of SpaghettiOs with meatballs after a cooker malfunctioned at one of the company's plants in Texas. ConAgra said it was recalling the Marie Callender's meals after it was informed by the federal Centers for Disease Control and Prevention of a possible link between the meals and 29 illnesses. Eight of those sickened reported eating the product in April or May. The company is recalling all of the meals, which are labeled "Marie Callender's Cheesy Chicken and Rice White Meat Chicken and Broccoli over Rice Topped with Rich Cheddar Sauce," regardless of production date. It was distributed to retail outlets nationwide. ConAgra was linked to two other high-profile recalls in 2007. That year the company's Banquet pot pies were linked to 401 cases of salmonella in 41 states and its Peter Pan brand peanut butter was linked to at least 625 salmonella cases in 47 states. 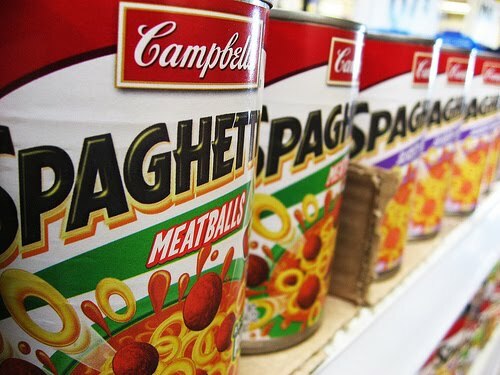 There have been no illnesses related to consumption of the SpaghettiOs, but Campbell spokesman Anthony Sanzio said the company is recalling certain lots of the product manufactured since December 2008 "out of an abundance of caution" because officials don't know exactly when a cooker at the Paris, Texas, plant malfunctioned. Because the cans were not sufficiently heated, Sanzio said, they could be ripe for bacterial growth and the product could spoil before its use-by date. Sanzio said the company believes the cooker malfunctioned recently but that officials are not certain. He said there are likely about 35,000 cases of SpaghettiOs subject to the recall on the market right now, but USDA announced the recall of 15 million pounds because that is all of the product that has been manufactured since December 2008. Much of it has likely been consumed. Recalled are certain lots of three varieties of the pasta product often consumed by children: SpaghettiOs with Meatballs, SpaghettiOs A to Z with Meatballs, and SpaghettiOs Fun Shapes with Meatballs (Cars). The recalled products have "EST 4K," as well as a use-by date between June 2010 and December 2011 printed on the bottom of the can. The products were manufactured between December 2008 and June 2010 and distributed to retail establishments nationwide. CONTEST DEADLINE! FOUR (4) BLENDERS GIVEN AWAY TODAY! FOUR MAGIC BULLET BLENDERS TO BE GIVEN AWAY! Super Quick, Super Chewy Brownies - From a Cake Mix! In a curious case of the disappearing photos, I uploaded a bunch of pictures off my camera last night and this morning I see only about half of them are there. What happened to the other half? Gone. Gone. Gone. The one lone photo of the brownies I made on Sunday is this one. It was before they were topped with hot fudge sauce and nuts but hopefully they still look so delicious that you will forgive me for such a bad shot. This is a basic recipe that I change every time I make it depending on what I have on hand in the cupboards. Usually I make these with caramel swirled in them but alas, no caramels and no caramel ice cream topping this time around so my family got chocolate chips and hot fudge sauce. Remember what I always say... use a recipe as a 'guide' and play with your food! Make it your own. Preheat oven to 350 degrees. Combine the cake mix and nuts in a large bowl. Stir in melted butter and 2/3 c evaporated milk. The batter is going to be thick. Spread half the batter in the bottom of a 9X13" pan. Bake 15 minutes. While the first layer of brownies are baking heat the remaining evaporated milk with the caramels over low heat in a pan or microwave them - stirring often. Sprinkle the chocolate chips over the warm brownies, drizzle with the caramel sauce and then drop the remaining brownie batter over the top in teaspoons. Bake an additional 25 minutes or so, until the center is just set. Let cool completely before cutting. Contest Time! Please Spread the Word and Twitter it Too! Contest open to residents of the United States and Sponsored by Magic Bullet UPDATE: CONTEST IS CLOSED! THANKS FOR ENTERING! It's time to give away a Magic Bullet To Go Blender! The contest will run through Friday, June 18th. Magic Bullet wants to hear all of your delicious snack recipes! 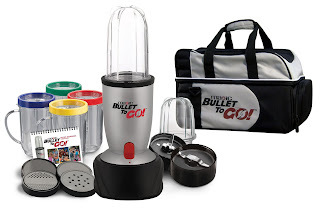 If you think you have the best recipe you could make in a Magic Bullet blender, share your recipe with the blogosphere – you might just win a Magic Bullet To Go along with the travel bag. Just leave a comment sharing your snack food recipe and who knows maybe your recipe will influence a future Magic Bullet Recipes book! 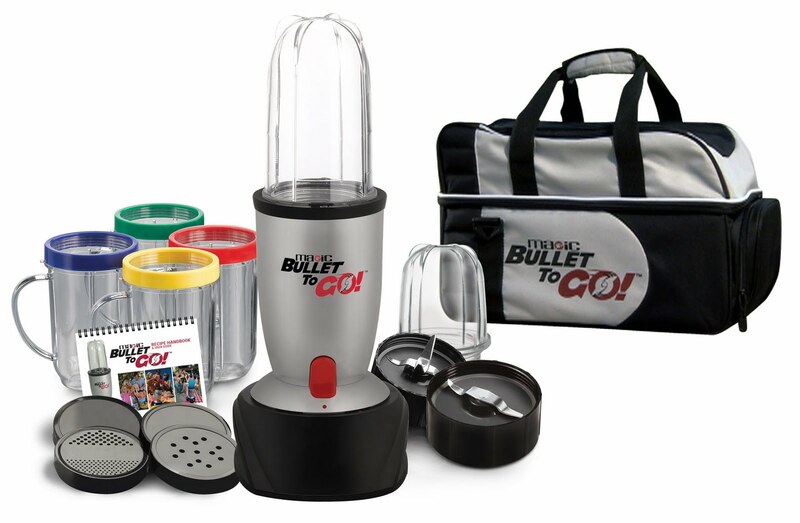 Also, in order to win you must be a fan of the Magic Bullet - The Official Page on Facebook. Here is the link: (or cut and paste; http://www.facebook.com/MagicBulletTheOfficialPage ). I will forward entries to Magic Bullet on Friday afternoon - after 5:00 central standard time. All recipes will be submitted to them and they will chose the winners! Be sure I have your correct email with your recipe entry so they (Magic Bullet) can contact you to let you know you've won!! This is a dip that was served by my boss at my very first baby shower, when I was pregnant with my oldest daughter 20 years ago. I was young and straight from the heartland of America where my mother's spice cupboard held salt, pepper, Lawry's Salt and garlic salt. I had never heard of Beau Monde seasoning but once I had this dip I knew there was a bigger world than dill and bay leaves. Combine all ingredients. several hours. Serve with fresh vegetable dippers or with chips. Sunday Pot Roasts? Yes. Two of Them. My regular readers might remember that last Fall we bought a side of beef for the first time ever. The beef was raised by my brother and his boys for a 4-H project. Because we have all three teenagers home this summer and I wanted to make roast this afternoon, we have two roasts in two slow cookers on the counter at this very moment. The two roasts will ensure that after cooking we'll have enough to feed 5 hungry adults and have leftovers for tomorrow. Although there are no real recipes for todays dinner, I decided to post them to give everyone an 'idea' for dinner if they too have a rainy, lazy Sunday afternoon. I did take a picture but my oldest daughter has the memory stick adapter so my photos are stuck in the camera. I found one on Google though and yep, that is pretty much what a typical roast looks like so it will do! I made it this way today for two reasons. One - I didn't use fresh veggies this time because we don't have potatoes or carrots on hand... and no one in my family likes to eat carrots cooked with the roast anyway. Second - I had a spare package of Lipton Vegetable mix (dry) in the cupboard and decided to use it so we can have the vegetable flavor without the mushy carrots afterwards. 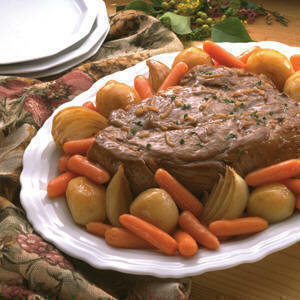 1 frozen or thawed roast - 3-4 lb. Heat on high in crock pot until done - low or high depending on your schedule and how much time you have to cook it. 1 frozen or thawed roast 3-4 lbs. Enter to Win! Magic Bullet wants to know what your favorite snack food recipe is! Open to US residents only and Sponsored by Magic Bullet CONTEST IS CLOSED! THANKS FOR ENTERING!!! 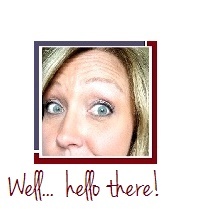 It's time for another contest here on the American Housewife website!! This time, Magic Bullet wants to know what your favorite snack food recipe is! Beginning Monday, (June 14th) the contest will run through Friday, June 18th and all you need to do to enter is post your favorite recipe in the comment section below! Summertime is in full swing and you know what that means - delicious snacks. Magic Bullet wants to hear all of your delicious recipes! If you think you have the best snack recipe, share your recipe with the blogosphere – you might just win a Magic Bullet To Go along with the travel bag. Also, in order to win you must become of fan of the Magic Bullet - The Official Page on facebook. 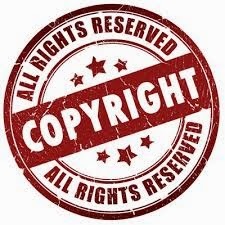 Here is the link: http://www.facebook.com/MagicBulletTheOfficialPage. After 'reminding' my husband for a week that we needed to go up and see his Dad for his birthday, he finally got around to calling him Friday (yesterday) to see if he would be home and free today for us to visit. It's a 6 hour drive round trip so I didn't want to drive across the state only to find him not home! Yesterday when I found out we were indeed, going to be making the trip to see him on his 82nd birthday today, I also found out my SIL and her husband were there last night and this morning. I'm assuming they probably brought a cake or made one at his house so I don't want to show up with yet another cake... but our family and our kids would like to celebrate with him as well. I decided for a quick birthday dessert and maybe more importantly, the ease of traveling 3 hours in the back of the SUV... cupcakes!!! Since I didn't have time to do anything fancy or special this time (yesterday was a DAY, let me tell you!!!) I started with a chocolate cake mix made according to package direction and baked into 20 cupcakes. Next I used my favorite frosting/filling recipe and placed it into a decorator baggy with a simple round tip. Hint: Place your bag into a tall glass or a coffee mug to easily hold the bag secure while you fill it. Squeeze a bit of filling into each cupcake. You know how much because it will just barely start to bulge on the top as it's filled. For frosting I used about a half cup of filling that was left over in the bowl and added 1 stick of butter, 1 t of vanilla extract and 2 cups of powdered sugar. I mixed it with the electric mixer until it looked like whipped cream and then refilled the bag, piped on the frosting and finished with pearlized candy candies. The cupcakes are all back in the muffin tin baking pans and are currently in the freezer awaiting transport across the state to my FIL's house later today. For the past two weeks all of the photos I've been taken are trapped on my camera. My memory stick doesn't fit into my new computer without an 'extended', which I had given to my daughter when she went on her mission trip. She just returned from the trip but this morning is sound asleep and I'm not sure where the extender card is! I wanted to post about mashed turnips and include the photos I took but we'll have to suffice with an image of turnips off the internet. I did not grow up eating turnips. It was something my parents never made, never grew in our garden and certainly never bought. On the contrary, I've made, bought, grown and eaten many foods they've never heard of. Turnips are a food my husband and I 'discovered' about 9 years ago when we first did a strict low-carb way of eating to detox our bodies of all sugar and white refined flour. Last night I made them our all-time favorite way; mashed. Similar to mashed potatoes, but these have a grainy texture to them and a spice, flavor that blows bland potatoes away. Best of all? Low Carb for those of you doing this WOE. Amounts in recipes are (and have to be) approximate. The amount of liquids and butter are determined by how many turnips you use, how big they are and how much water is retained after you drain them. Go slow, add the milk (cream if you are low-carbing) a little at a time and season according to your tastes. If you buy your turnips at the grocery store they will probably be enclosed in a thin covering of wax. Fresh from the garden or a farmer's market obviously won't have the wax. Either way, you make them the same. Peel and cut up the turnips into pieces for easy boiling. Boil in water on the stove until tender (about 30 minutes depending on how many you have). Drain well. Place into a food processor and using an S-blade, process just a little (4 seconds or so) to judge how much liquid they already have. You add milk or cream about a couple tablespoons at a time to get the consistency of mashed potatoes. Add butter to your own taste (I like about 2 tablespoons to 4-5 turnips) and salt and pepper. Process again quickly, you only need to process a few seconds. Pour into your serving bowl. These are excellent with BBQ Ribs!